Lake County western flax is listed as a California endangered plant species, which means that killing or possessing the plant is prohibited by the California Endangered Species Act (CESA). Lake County western flax is an annual herb that typically produces flowers with white to light pink petals from May to June. This species has been found growing in open areas of serpentine soil chaparral and has only been found in several square kilometers of habitat north of Middletown in Lake County, California. Niall McCarten investigated Lake County western flax and other Rare and Endemic Plants of Lake County Serpentine Soil Habitats with funding from California Endangered Species Tax Check-off Funds. 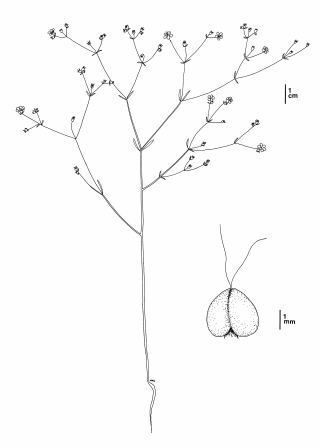 At the time of this webpage posting, the California Natural Diversity Database (CNDDB) reports six occurrences of this species that were known to exist, however it is important to note that the population records for Lake County western flax have not been updated for over 20 years. All known populations of Lake County western flax occur on two privately-owned ranches. The habitat upon which Lake County western flax occurs is used for cattle grazing. Although light cattle grazing may not be a threat to the species, heavy cattle grazing is likely a threat due to direct consumption or trampling of plants, or from soil disturbance and subsequent introduction of invasive plant species. Evidence of heavy cattle grazing has been observed at some occurrences in the past. Any development, construction, or other change to a more intensive land use in the area would also constitute serious threats to the species. Lake County western flax may also be threatened by climate change or by random natural or human-caused events. Because populations of Lake County western flax all occur on privately-owned land, cooperation with landowners is crucial to ensure the continued existence of the species. Populations of the species should be re-surveyed and monitored using standardized protocols and current threats to the species should be re-assessed. Additionally, the impacts of cattle grazing on the species should be investigated, and measures should be implemented to reduce current threats to the species. CDFW may issue permits for Lake County western flax pursuant to CESA, and you can learn more about the California laws protecting Lake County western flax and other California native plants. Populations of Lake County western flax occur in CDFW’s North Central Region.